Do you like the sound of NY Cheesecake, Salted Caramel, Cookie Overload or Grasshopper Pie? 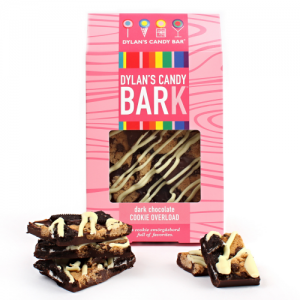 These are a few of the eight flavors available of Dylan’s Candy Bark. It’s our top pick for stocking sweets that will be oh so hard to share. Save $2 when you order two bags. 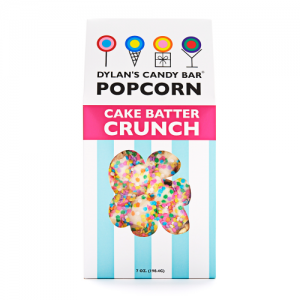 Arrive with Cake Batter flavor Dylan’s Candy Bar Popcorn and you will most certainly win the best party guest award this year!! And that’s just one of six flavors to choose from! 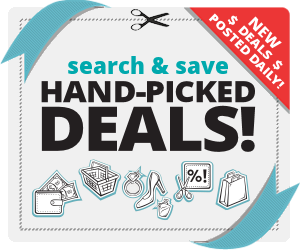 Buy three bags and save $3. Flavors include White and Dark Chocolate Swirl, Peanut Butter Cup or Cookies and Cream! Your hosts will want to sneak away and crunch. 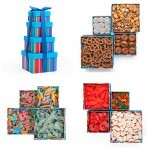 With Dylan’s Candy Bar Sweet Treat Tower you can mail sweetness with a variety of goodies. Your gift recipient will be open a large box outer box and find the tower of four gift boxes inside. Then they get to enjoy discovering the goodness inside each box. 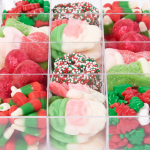 Choose chocolate, sour or gummy style candies and get a range of yummies in your chosen flavor. This impressive tower is $50 and currently on sale for 15% off. Treats red and green candy assortment featuring Gummy and Chocolate Peanut Butter Santas, Gummy Snowmen, Nonpareil Christmas Pretzels, Sugar Trees and Snowmen & Tree Holiday Corn. The box is $28 and includes nearly 20 ounces of pure deliciousness! Your family and friends will be hanging close to the candy bowl. Make your guests feel exceptionally honored in your home with this unique assortment. OH and remember to have a few extras gifts ready in case an unexpected guest arrives. So order a few extra! And hey if they aren’t gifted you may have an extra package under the tree for yourself! Enjoy your goodies and have many special surprises waiting this holiday to let your family and friends know how much you appreciate them!